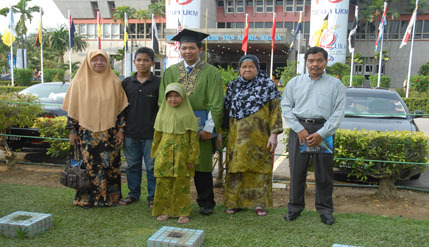 BANGI, 11 August 2010 – The solemn, traditional and colourful convocation ceremony of Universiti Kebangsaan Malaysia (UKM) over the last four days has gladdened the hearts of parents, graduates and their family members alike. Happiness and excitement can be clearly seen on their faces as they and their other family members some even including grandparents in tow trooped around the campus ground for pictures, lending a carnival-like atmosphere to the university. What also made the occasion more memorable was that most of them were dressed in their Sunday best and they seemed to relish the time looking around the campus, taking pictures with their loved ones. 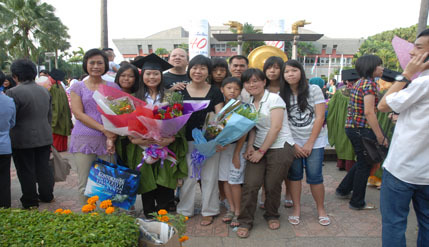 Be they Malays, Chinese or Indians, the convocation ceremony which started from Saturday had been eagerly awaited for by the parents, who saw the mortarboards as the laurels of their labour and sacrifices in raising their children. In the midst of all these excitement and exhilaration, some elderly men and women were seen falling asleep on their chairs in the corridors, probably too exhausted from the long wait after having to wake up well before dawn to make it to the ceremony which started at 8am. UKM’s 38th edition of the convocation saw 7,376 graduates receiving their scrolls over four days with two sessions a day. Of the graduates, 233 received their Doctors of Philosophy (Ph.Ds), 183 Master’s specialist doctors and dental surgeons, 1,380 Masters, 5,097 Bachelors, 402 graduate diplomas and 72 diplomas. To husband and wife, Ahmad Baqir bin Ramli, 42 and Nor Azilah binti Hamzah@Abdul Razali, 40 both teachers at the Sekolah Jenis Kebangsaan (Cina) Khee Chee, their four years of study having to commute about 100km twice a week every weekend from Temerloh to Bangi had been a worthwhile effort. Life had been hard but lovely, both agreed as they had succeeded in getting their first degrees at the same time after all the challenges and sacrifices they had to undergo during the four years of study through their long distance learning programme. Both received their Bachelor’s degrees with honors in Malay studies. “We were lucky since both our children are now teenagers and understand the need for us to pursue our studies,” said Azilah. All the graduands as well as their parents have their stories of sacrifices and challenges they faced in pursuing their studies. For Puan Zuraifa binti Md Radzi, 43, the ceremony and the wait for her eldest daughter Nur Faradilla Roslan to go up the stage to receive her Bachelor degree in Oleochemical had set her heart thumping. “I was filled with happiness as I felt that my labor all these years has been rewarded,” said Puan Zuraifa who is a clerk with the Employees’ Provident Fund in Kuala Lumpur. She had not seen a convocation ceremony before and she was awed by it. “It was very well organized and I did not see any confusion,” she said, adding that she has three other children, the youngest of whom is 13 years old. Her husband, Encik Roslan bin Mat Ali, 50, who is a security officer with Malaysia Airports Berhad, said he was very happy and excited to see that his daughter had succeeded in her studies at UKM. “If I can, I want all my other children to follow the footstep of their sister,” he said. Nur Faradilla, 22, who has taken up a temporary job as administrator, said she was very happy with the convocation ceremony. 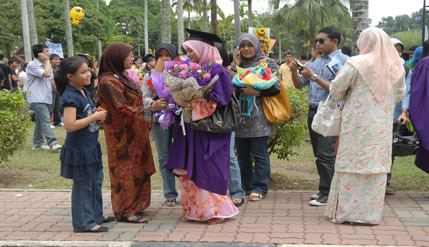 Clutching her bouquet of flowers and degree in her hands, she posed for photographs with her parents, grandmother, siblings, uncles and an auntie outside Dewan Canselor Tun Abdul Razak (DECTAR). 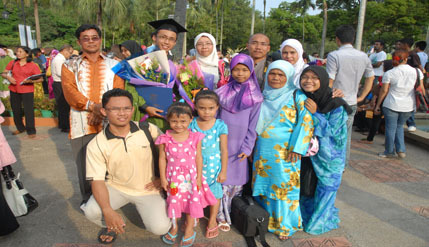 In the case of the Padasan family, the long drive from their home in Lunas, Kedah to see their eldest daughter, P. Shobita, 25, go up the stage to receive her Bachelor degree in Bio Informatics, was worth all the efforts. 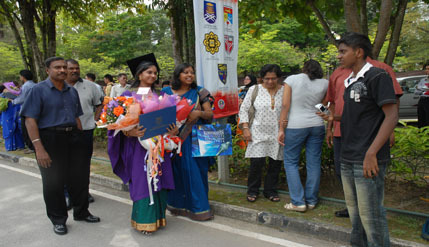 His wife, Yawanarani a/p Perumal, a headmistress, said the convocation was long awaited by the family. She said she and her husband had to take leave and they had brought along their other children to the convocation to inspire them in their studies. Like the other parents, she said they were ready with the camera to zoom in on their daughter when she was receiving her degree. “It was worth the long drive and long wait,” she beamed as she and her family and relatives posed for photographs outside DECTAR. Shobita said she was “very nervous” at first but when she was lining up with her friends, she lost her fright. “It was a very nice ceremony, very systematic,” said Shobita, who is now working in Information Technology Support with Datacom in Damansara, the American company that is providing IT solutions and services. 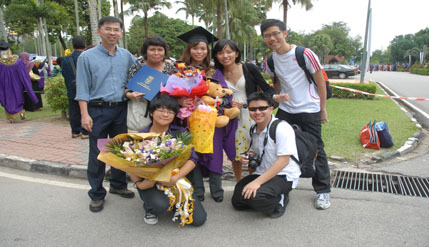 Equally excited were the Lim family from Pulau Pinang who came to see their daughter, Joanna Lim Wee Ling, 23, received her degree in Chemistry. The father, Lim Theam Chye, 51, a Human Resource Manager, said he was both happy and excited to see his daughter, the elder of their two children, graduating. Armed with his video camera which he kept recording his family members, he said it was the first time that he had been to a convocation ceremony. 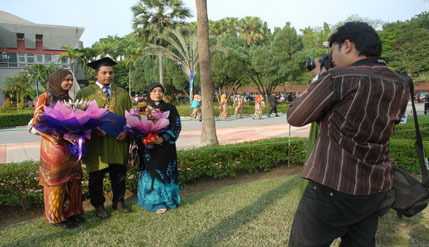 He and his wife, who is working as a supervisor, drove down from Pulau Pinang for the convocation a day earlier. Joanna, who plans to pursue a Masters degree in Chemistry either at UKM or Universiti Sains Malaysia, said she was both “happy and nervous” during the convocation ceremony. Her ambition is to be a lecturer. “The ceremony was fast. I had hoped to be on the stage a bit longer,” said the Pulau Pinang lass who did her pre-University studies at the Penang Free School. For Siti Haslina binti Mohd Shafie, 23, who graduated with her Bachelors with Honours in Geography, the hard life of her parents as padi planters in Langgar Alor Star had driven her to further her studies and was grateful that the Public Services Department had awarded her a scholarship to pursue her Masters degree. Haslina who is only 120 cm tall will continue to stay in Dato’ Onn College as it is just across the road to her Faculty of Social Sciences and Humanities.